Win a Car Promotion at OnlineBingo.Eu – Ends November 30th!! Only 3 days left in the Win a Car Promotion which is running from NOW until November 30th – read further for more information. Affiliate Banners available. Open to all players is the chance to win a Car (or cash alternative). To be eligible to win, all players (existing and new) must have at least deposited and made a minimum cash wager of €100/1000kr in November to be entered into the prize draw. For every €100 wagered they receive an extra entry into the prize draw. Players must be in the bingo room to claim prize or another winner will be selected. For Full T & C. more information, as well as information on how to promote this Win a Car promotion to your players, please visit here. Perfect Pick Promotion for you to promote to your players running this Friday, Saturday and Sunday – 25th – 27th November. Perfect Pick returns with €300/3000kr prizes every night! This Friday, Saturday and Sunday, we’re offering a phenomenal Perfect Pick prize of £300 every night! Perfect Pick is easy to play: Just spend €10/100kr cash or more on bingo before 9pm that day, and you’ll be able to select a number on the Perfect Pick promotion page. If your pick is the first number called in that night’s 10pm Linked UP 75 game, you’ll win or share €300/3000kr (€150/1500kr + €150/1500kr Bonus)! If nobody picked the first number called in the game, we’ll go to the next number until it matches someone’s Perfect Pick! You can check your status via the in-game Promotions page (click “?” in the top-right of any bingo room). Once you’ve qualified by spending a minimum of €10/100kr cash before 9pm, you’ll be able to make your pick for the 10pm game. It’s not necessary to purchase tickets for the 10pm game, but we’re sure you’ll want to be there to see if your Pick pays off! To participate in any promotional offer players must have deposited within 7 days of the promotion’s start date. Promotions are open only to players whose accounts are in good standing through the full term of the promotion. Players whose accounts are not in good standing for any portion of the promotion, or during prize allocation, will forfeit any wins. Free bingo games do not contribute to and are not eligible for inclusion in any promotion unless expressly stated. All promotions are based on cash wagering unless specified otherwise. Promotion period is 25 November 12:00am through 27 November 11:59pm. Players must spend €10/100kr CASH on bingo before 9pm in order to qualify to make a Perfect Pick. Qualification status is displayed on the Perfect Pick page via the in-game Promotions link. Players are not required to have tickets in the 10pm Linked UP 75 “Perfect Pick” game. If the first number called in the 10pm Linked UP 75 game matches a Perfect Pick, all qualified players who selected that number as their Pick will share the €300/3000kr prize. If the first number does not matches a valid Perfect Pick, the second number will decide the winner, and so on. The €300/3000kr Perfect Pick Prize will be awarded as €150/1500kr Cash and €150/1500kr Bonus. Please allow up to 24 hours for crediting. Only the first number picked by the player will count. For thousands of years there have been legends of a lumbering ape-like creature roaming the harsh Himalayan mountain region. The Tibetans call him “Yeti”, but the rest of the world knows him as: The Abominable Snowman! He’s an elusive, secretive creature, leaving behind no evidence of his existence beyond some monstrous footprints in the snow. The Yeti has made a rare appearance for our latest Challenge and has left behind two new games: Yeti Mountain & Yeti Footprint! Join us as we stalk the Yeti twice an hour (6am-1am) in Lucky Streak and Money Tree. Earn [€5/50kr] every time you win both the Yeti Mountain and Yeti Footprint Challenge games! The first time you complete the challenge you’ll also win the Yeti Challenge Badge and access to the [€750/7500kr] Thursday night Tournaments. When you complete the Challenge by capturing wins in BOTH games (on any part), you’ll earn € 5/50kr Bonus and the Yeti Badge for your badge board! You’ll also be able to join us for the Challenge Tournament games, playing at 9pm in Madhouse every Thursday night. Even better, for every pair of wins (both games) you’ll earn another £5! Promotion runs: 12:00am GMT 25 November through 11:59pm GMT 8 December. When players complete a Challenge by winning both Challenge games they earn € 5/50kr Bonus, a Challenge badge for their badge board, and entry to the weekly tournament held Thursdays in Madhouse at 9pm. Every subsequent time the Challenge is “completed” again, the player earns another € 5/50kr Bonus. Bonuses are credited after qualification (please allow up to 24 hours). Parlay Game Services Alderney retains the right to use and publish the names and/or aliases of winning players online and in any other media in connection with the game. Acceptance of a prize constitutes permission for Parlay Game Services Alderney to use the winner’s name for advertising and promotional purposes without additional compensation unless prohibited by law. We reserve the right to reclaim the prize awarded if customers are found to be tampering with or abusing any aspect of this promotion, as solely determined by Parlay Game Services Alderney. If a player is found to be abusing any aspect of this promotion, as solely determined by Parlay Game Services Alderney, we reserve the right to reclaim the prize awarded and terminate the customer’s eligibility to participate in the promotion. Parlay Game Services Alderney reserves the right to cancel, reclaim or refuse this promotion at its own discretion. This promotion is subject to our official terms and conditions, which shall be binding in all cases. Employees, officers and directors of our parent company or any of our licensees, software suppliers and developers, affiliated or subsidiary companies are not permitted to register with us or to participate in this promotion. Participation in Bingo is open only to the residents of those jurisdictions where such participation is legal. It is your responsibility to ensure that the laws of the country in which you are resident entitle you to play Bingo. All terms and conditions are subject to modification or change. In the event of any disputes the decision of the Bingo Promotions Manager is final. Win a CAR promotion is running NOW until November 30th – read further for more information. Affiliate Banners available. For Full T & C, please click here. 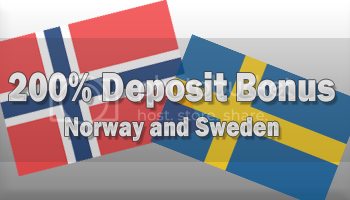 200% deposit bonus for Norway and Sweden. Hello-Hello!! We have two new Challenge games playing daily twice an hour (7am to 2am): Wave Hello & Kiss Hello! Win both games for [€5/50kr] Bonus, the new Challenge Badge, and gain entry to the exclusive Thursday night Tournaments for [€750/7500kr]! Salut! Hallo! Hej! Hola! Hello! How many ways can you say Hello? 21 November is World Hello Day, which is celebrated in 180 countries as a way to remind world leaders to settle conflicts with communication rather than force. You too can participate in this expression of peace and harmony: Just say “Hello!” to 10 different people on Hello Day! Speaking of greetings, it’s time to say “HI!” to our latest Challenge games: Wave Hello & Kiss Hello! These games play twice every hour from 7am to 2am every day in [Money Tree] and [Lucky Streak]. When you win BOTH games, you’ll earn [€5/50kr] Bonus, the Challenge Badge, and entry to the Hello-Hello Challenge Tournaments playing for [€750/7500kr] in prizes! Tournaments play Thursday nights at 10pm in [Madhouse]. Promotion runs: 01:00am CET 11 November through 00:59am CET 25 November. When players complete a Challenge by winning both Challenge games they earn €5 [50 kr] Bonus, a Challenge badge for their badge board, and entry to the weekly tournament held Thursdays in [MadHouse] at 10pm. Every subsequent time the Challenge is completed again, the player earns another €5 [50 kr] Bonus. Bonuses are credited after qualification. Bingo on #11 for [€11/110kr]! 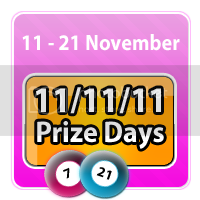 11/11/11 is the start of 11 days of great prizes! Play bingo or slots and you could earn up to 3 entries each day to the final [€1111/11110kr] Cash Draw! Also, from 11am-11pm daily you could win [€11/110kr] Bonus whenever you bingo on the number 11! This is the first year of the century in which we have 4 unusual dates: 1/1/11, 1/11/11, 11/1/11, and finally 11/11/11! So for the next 11 days we’ve offering some great prizes of cash and bonus based on that number. First, from 11am to 11pm every day in [Lucky Streak] and [Money Tree], you could win [€11/110kr] Bonus every time you bingo on the number 11 on any part of a game. You can earn up to 3 entries each day (one per type). On 22 November, we’ll be randomly selecting 11 players who will each receive [€101/1010kr] in CASH. Promotion runs: 1:00am CET 11 November through 00:59am CET 22 November. A total of €11/110kr Bonus will be awarded to winning players when any part of a pay bingo game is won on the number “11” in qualifying bingo rooms. Qualifying rooms and times are [Lucky Streak] and [Money Tree] from 11am until 11pm (not including the 10pm game). Prizes will be awarded automatically as €11/110kr bonus. Multiple winning players on the same part will share the prize equally. Eleven (11) prizes of [€101/1010kr] cash will be awarded on 22 November 2011. Winners will be selected via random draw from all Entries earned by all eligible players. Winners’ accounts must be in good standing during the promotional period and the day of the draw, and have made a deposit within 14 days of the draw date. Each Entry type may be earned only once per day up to maximum of 3 Entries per day. These qualifying Entries will be automatically entered into the 22 November random draw: One (1) Entry for each day a player spends a minimum of [€11/110kr] cash in one day on any pay bingo game; One (1) Entry for each day a player spends a minimum of [€11/110kr] cash in one day on any cash slots game; One (1) Entry for each day a player has completed the current Challenge, which requires winning any part of both Challenge games within the same day. Bonus spending does not qualify towards the minimum daily amounts for Entries. Eleven winners will be credited [€101/1010kr] cash each within 48 hours of the 22 November draw date. Only one (1) [€101/1010kr] cash prize per winning player. Win a Car Promotion at OnlineBingo.Eu affiliate banners are available – log into your affiliate account at http://www.euroaffiliates.com . For more information about this promotion – click here. affiliate, banners, Win a Car! Affiliates do not need a license as long as they do not have any relations to players, own gambling data, own rights associated to trademark or own parts of gambling systems. Affiliates: Win a CAR promotion is running NOW until November 30th – read further for more information. If you would like to promote this to your players, and you would like to open an affiliate account at EuroAffiliates.com, please click here. If you have any questions, please email us at [email protected]. 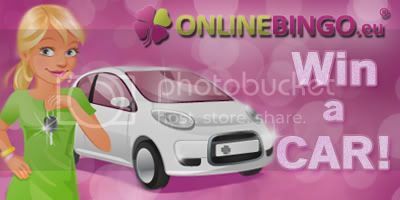 affiliates, bingo, euroaffiliates, onlinebingo.eu, promotions, Win a Car!